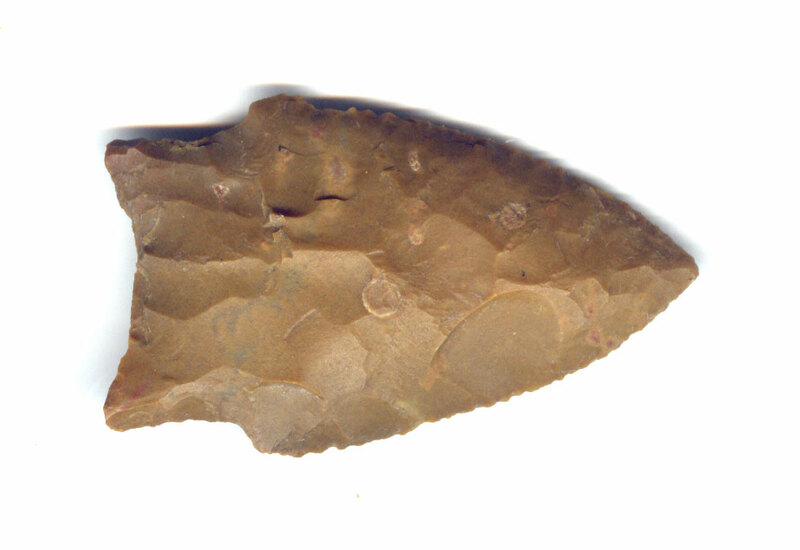 A Medium To Large Size, Anciently Aged And Visibly Use Sharpened, Johnson Point That Exhibits Surface Sheen And Stone Coloration Aging Patination, Correct Rolled Basal Stem Edge Hafting Dulling, Aged Surface Deposits, Aging In The Basal Stem Notches, Correct Blade Use Sharpening Reduction, Correct Basal Thinning, Correct Style Blade Flaking, Correct Basal Shape And Overall Form, Correct Material And Manufacture For The Area Found. Ex-Dennis Smith Collection. The Type Is Named For Examples Found At The Tom's Brook Shelter, In Johnson County, Arkansas. This Is A Nice, Collectible Example. Includes A Ken Partain Certificate Of Authenticity!